The purpose of this study was to compare the sagittal surface areas (SSAs) of the space available for the cord (SAC) at the occiput (OCC)-first cervical vertebra (C1) and C1-C2 levels determined at neutral head position, and during conventional and balloon laryngoscopy [1,2]. Anesthesia was induced in eight ASA I, Mallampati I, elective surgery patients. 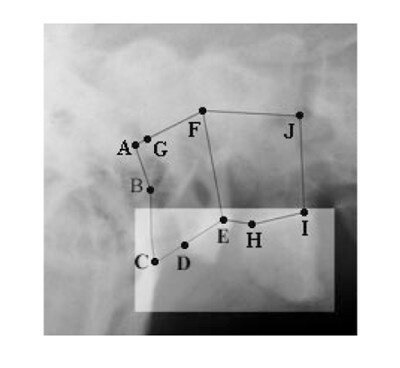 Cross-table lateral-view radiographs were taken at neutral head position (NHP) and upon maximal laryngeal exposure (MLE) with a #4 standard and a #4 modified blade carrying two 10 Foley catheters. MLE during balloon laryngoscopy was achieved by right catheter-balloon inflation with 2 ml air and blade-elevation [1,2]. The radiographs were scanned in Photoshop 5.0, the X-ray magnification was determined, and the OCC-C1 and C1-C2 SAC-SSAs were measured with Autocad 2000. The OCC-C1-SAC and C1-C2-SAC anatomic landmarks are shown in Fig.1. Data were analyzed with Kolmogorov-Smirnov test and ANOVA. At the OCC-C1 level, the SAC-SSA was significantly reduced during conventional laryngoscopy (MLE-value =0.386± 0.104 in2, NHP-value =0.501± 0.11 in2, P=0.0095). During balloon laryngoscopy, there was no significant SAC-SSA reduction (MLE-value =0.423± 0.128 in2, P=0.07 vs NHP-value), while the SAC-SSA was significantly greater than the SAC-SSA determined during conventional laryngoscopy (P=0.044). At the C1-C2 level, the SAC-SSA-changes were nonsignificant. The OCC-C1-SAC is significantly less affected by balloon laryngoscopy.